When it comes to being a leader Hamilton Tiger-Cats defensive back Jonathan Hood is definitely no stranger. The 27-year-old Mississauga, Ontario native who began his football career in the tenth grade has thrived with positivity on and off the field since he can remember. Now in his third season with the Ti-Cats, Hood has kept himself busy by playing the sport he loves and using his positivity to inspire others around him, mentally, physically and emotionally. The former 26thoverall pick runs a youth mentoring program during the entire school year and hosts football camps four months of the year, as well as participating in various Tiger-Cat team initiatives and individual appearances. The 10-week mentoring program focuses on week-by-week different aspects such as leadership skills, building a vision for your life and goal setting. “We do activities, handouts and we’ll give them an assignment. The next week we’ll go over the assignment and then do another theme, so we go theme by theme,” Hood explains. “At the end of the program we do a big group assignment and we let them choose their assignment. One school did a landscaping assignment, some schools like doing mentoring for the feeder elementary schools and the kids love it because it gives them a new perspective aside from what their teachers or parents may teach. The kids have a lot of fun and we have a lot of fun,” he continued. “We do it because we understand that we had mentors when we were young and they helped a lot because they give you a different view point, they help you learn and it’s learning through a different means. Everybody goes to school and sometimes there’s a disconnect between the teachers and students because it’s tough to relate to some teachers. We just keep it real, be very relatable and we aren’t too far removed from high school so we’re cool with them and it’s a good opportunity for them to learn from someone else’s view point and to see things first hand, because if you’re in a tough situation it’s hard to see something better if you’re never introduced to it,” elucidated Hood. 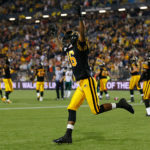 Alongside his work in youth development, Hood and Tiger-Cats teammate Ryan Hinds, whom he is accompanied by for the mentoring program, also run football camps in Oakville, Ontario from January to April dating back to 2010 and are also joined by Edmonton Eskimos wide receiver Matt Carter. With friends and colleagues playing in all parts of Canada for every team in the CFL, Hood hopes to eventually take his camps and mentoring programs to nationwide statuses. “With Matt (Carter) out there now he can test the market out west and see if the need is there and if everything we do can be transferred over there. I have different friends on different teams that I went to high school with and we have similar mindsets and we all had mentors at our schools, so if we could spread the programs nationally the sky’s the limit, we have a big vision,” said the former St. Francis Xavier and Western University star. Like his commitment on the field and dedication to his teammates, Jonathan also takes part in almost every community initiative the Tiger-Cats promote and participate in. “With the team we do a whole bunch of initiatives. One is called Be Fit, where we go to different schools and do a presentation about eating right and living a whole active life style. We do another one called Cops and Cats where we team up with the Hamilton Police and play basketball with the kids for cancer research, and we take part in Tim Horton’s Camp Day. The team is heavily involved in the community and I’m all about it so they call on me to do a lot of stuff with them,” said Hood. While on his own, Hood doesn’t take any time off from speaking with youth and adults and dedicates almost every minute he has to motivating and inspiring the entire community. “I speak on my own at schools, day camps, business lunches and events. My message is persistence and persisting until you succeed, how to reach your goals, having faith and just presenting a message that inspires people to do what they want to do because when you have a big goal or dream it always seems like there’s a whole lot of negatives and seems like the odds are against you, so when you can be uplifted and be given a little insight on the tools and things you can do to bring you closer to your goals it always drives you,” he elucidated. “Giving back wasn’t something that I really thought about, it was something I always lived. In school I was always a leader and I’ve always been an influence, whether in my family with younger siblings or to kids in my school, I’ve always been looked up to because of the roles I played. They always say when you have great power you have great responsibility, so you know everybody has responsibility to not inspire others but to live by example, lead by example, so that’s what I do, I lead by example,” he explained. Hood’s energy on the field and support for his teammates hardly goes unnoticed. His energy and excitement for not his own big plays, but those made by the guys around him translates into his persona and actions to the people he works to educate, train and inspire. His love for football is matched for his love of positivity and sharing, an infectious combination for all the right reasons.